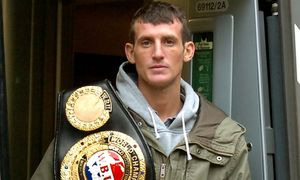 DERRY MATHEWS will fight for the vacant IBO world lightweight title against a former sparring partner of pound for pound king Manny Pacquiao. Unbeaten Uzbekistan hardman Alisher Rakhimov will stand in the opposite corner on Saturday, January 28 when Mathews fights for the global crown in his home city. A number of venues were discussed as possibilities to host the contest but city promoter Stephen Vaughan Junior has opted to take the world title showdown to the historic Olympia. Mathews’ gym-mate Tony Dodson will act as chief support when he defends his recently acquired IBO International light-heavyweight strap in front of an expected 1,600 capacity crowd. A number of fighters are being discussed for Dodson with the ECHO understanding that finding international opposition from the governing body’s top 100 is the favoured option at present. A clutch of local names fill the undercard for Mathews’ shot at a second world title - following his 2006-07 reign as WBU featherweight champion - with Nathan Brough, Chris Kelly, Andy Colquhoun, Wayne Adeniyi and Chris Metcalfe scheduled to feature. Vaughan Jnr wasted little time in planning Mathews’ next move after his European title chance against Gavin Rees ended in a frustrating technical draw earlier this month. No sooner had the blood finished pouring from Mathews’ broken nose then Vaughan began investigating the possibility of landing his boxer a crack at the unattached IBO bauble. The belt was last held by Australian Leonardo Zappavigna after he defeated Fernando Angulo over 12 rounds in March. Juan Diaz is the most high profile owner of the strap in recent times, winning the title on a split decision in 2008 against Australian warrior Michael Katsidis. To prove eligible for the IBO opportunity, Mathews had to be placed inside the organisation’s top 35 when the latest set of rankings were filed from their Florida headquarters just days after the Rees bout. Mathews, who claimed the IBO International lightweight belt in January this year with victory over Scott Lawton, was put 23rd in the listings and therefore given the green light to fight for the vacant belt. Vaughan Jnr, also handed the go-ahead to promote the bout, set about finding an opponent who met the required criteria but Scotland’s Alex Arthur, Cassius Baloyi of South Africa and American Jesus Chavez were all rejected by IBO chiefs. President Ed Lavine then nominated Rahimov and over the weekend contracts were signed for him to face Mathews. The ECHO believes Vaughan Jnr is currently in negotiations with executives over the possibility of securing television coverage for the fight. Rahimov (22-0) will carry vast amounts of amateur and professional experience with him when he comes to Liverpool in the New Year. An Olympian in 2000, where he reached the quarter-finals of the 54kg division, the 33-year-old holds the WBO Asia Pacific lightweight title and lies second in their rankings. A former WBC International champion, Rahimov is ranked one place below Mathews in the IBO listings but that multi-weight world champion Pacquiao deemed his as a suitable sparring partner in the build-up to 2009’s fight with Ricky Hatton, tells of his quality. Internet footage of the 5’5” Rahimov shows off his classic compact Eastern European style where the stocky fighter whips in combinations with speed from a low centre of gravity. Tickets are priced £40, £60 and £80 with a limited number of VIP tickets available. For details of corporate packages and sponsorship opportunities for the night, please call Stephen Speed on 07814822004 or visit www.vaughanboxing.tv.